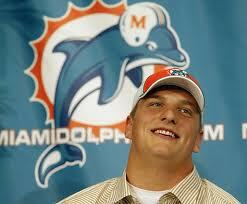 The day following the 2012 draft, which included Stanford tackle Jonathan Martin going to the Miami Dolphins, Jeff Ireland was quoted as saying, "Last night I saw an article about Jake Long. I have plans to keep Jake Long right here for a long time. 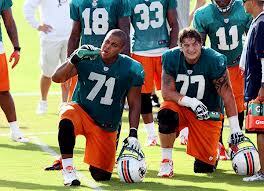 We drafted Jonathan Martin to be a right tackle on this football team. A right tackle on this football team so let's don't speculate any further than that." That was then and this is now... As Ireland said then, the Dolphins would love to keep Jake Long in Miami for a long time, but the economics of the NFL may not allow it. Tom Condon, Long’s agent has been throwing around Joe Thomas numbers, $84 million over seven years, with $44 million guaranteed. Long currently sits on injured reserve, pulling in a tidy $11.2 million this season, in the final year of his $57.75 million rookie contract. Jake Long was the first overall pick in the 2008 NFL Draft and ended up in the Pro Bowl following each of his first four NFL seasons, but injuries have begun to take a toll. After making 42 consecutive starts, Long had missed a total of 18 snaps to start his career, participating in 99.4 percent of a total 2,838 snaps. Start number 43 would come with the help of a space-age shoulder harness. On November 14th of the 2010 season against the Tennessee Titans, Long dislocated his left shoulder and tore his labrum. 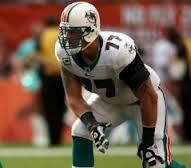 Jake Long earned the respect of the entire Dolphins organization by playing out the 2010 season with the harness. Immediately following the final game, Long had shoulder surgery to repair the torn labrum. Still rehabbing the injury, he began the 2011 pre-season on the Physically Unable to Perform list. Long could participate in conditioning and workout with the team, but he couldn’t participate in football drills until he was taken off the list. By the start of the 2011 regular season, Long was pronounced healthy and he reclaimed his left tackle position. Long left a December 11th Loss to the Eagles with a lower back injury, he would return the following week after intense rehab. The return was short lived, in a December 24th loss to the Patriots, Long tore his right biceps, four days later he was placed on injured reserve; his 2011 season over. The biceps was surgically repaired and following another off-season of rehab, Long was pronounced healthy for the opening of training camp in 2012. 2012 training camp, with the new coaching staff was going well, the biceps a non-issue, when on August 27th, Jake Long suffered a sprained medial collateral ligament (MCL) in his right knee during practice. Less than two weeks prior to Miami's season opener against the Houston Texas, Long was again hobbled. Like the true warrior he has proven to be, Jake Long put on the brace, took a shot of the NFL wonder drug Toradol and saddled up to face J.J. Watt and the Texans, a team Miami has never beaten. The game started well for Long until Watt took advantage of his limitations, batting two passes that went for interceptions. The Texans forced three turnovers on three plays and scored 21 points in 1:46 at the end of the first half, taking control in a 30-10 season-opening victory. Watt has gone on to have a stellar season with 20.5 sacks, two shy of Michael Strahan's record of 22.5 set in 2001 and still one game remaining to play. Slowed by injury, Long could not hold up against Watt and looked a step slow the entire season. 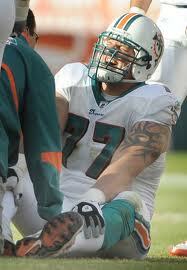 On December 2nd against the rival New England Patriots, Jake Long tore his left triceps. He was placed on Injured Reserve Tuesday, Dec. 4, his 2012 season ending much like 2011. The rookie Jonathan Martin was pressed into service at left tackle and has played well enough for Dolphin fans to question whether Ireland is still sticking by the quote he made after the draft. Martin may not have the physical presence of Jake Long, but he is a perfect fit for the zone-blocking scheme that head coach Joe Philbin brought to Miami. It is rumored that Miami could franchise Long, but it’s an expensive proposition. According to Mike Florio of NFL-Talk , the tender for an offensive lineman in 2012 was worth $9.383 million and will remain in that area as the salary cap is expected to remain flat in 2013. However, that won't matter for Long as his franchise tag would be worth $15.36 million, 120 percent his 2012 cap number of $12.8 million. That price seems disproportionate for a player who has not been healthy enough to finish his last two seasons. Florio has also speculated that Long's agent is possibly seeking a minimum of $26.56 million in full guarantees (Long's 2012 base salary, plus his franchise tag in 2013) and over $45 million in total guarantees. Long would earn $44.992 million if he played out this season and were franchised in both 2013 and 2014 and that might be why the Dolphins aren't rushing to make a deal. These numbers don’t make sense in light of Long’s injury history. This is an example of when an NFL team must cut ties with a player if the right contract numbers cannot be reached. It has nothing to do with whether the Dolphins believe in Jake Long or think he could continue to be an integral part of the offense, it is pure economics. Another team may be willing to pay the price Long’s agent is asking but the Dolphins are not. It is obvious, Tom Condon has not tried to lower the price tag on Long, or an extension would have already been inked. 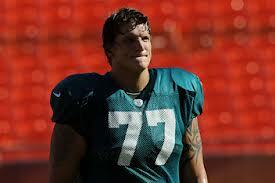 The only hope of Jake Long returning to the Dolphins may have to come from Long himself. If Jake Long wants to be a Dolphin and is willing to accept a contract more in-line with his performance, (still exceptional but not franchise) he will have to step in between Condon and Ireland and make the deal. 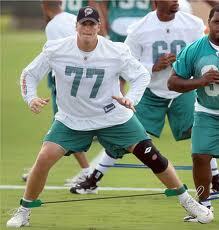 Ireland would be remiss in his duties to the Miami Dolphins if he were to spend the money Condon is demanding. For these reasons, only Jake Long can extend his stay in Miami… He is a great presence and when healthy, a great player, but the chances of Condon or Ireland blinking are not likely and Jake has probably played his last game as a Miami Dolphin.